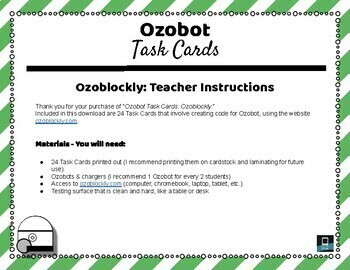 Included in this download are 24 Task Cards that involve creating code for Ozobot, using the website ozoblockly.com. 24 Task Cards printed out (I recommend printing them on cardstock and laminating for future use). Access to the website ozoblockly.com for students. 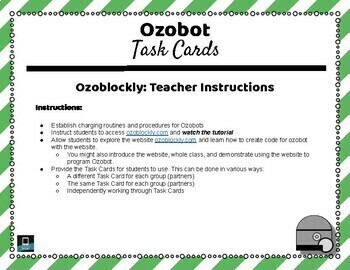 Allow students to explore the website ozoblockly.com and learn how to create code for ozobot with the website. You might also introduce the website, whole class, and demonstrate using the website to program Ozobot. Provide the Task Cards for students to use. 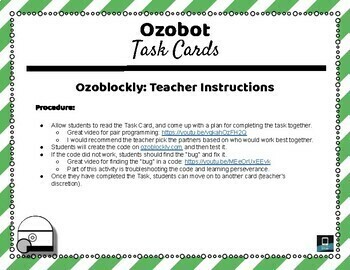 Allow students to read the Task Card, and come up with a plan for completing the task together. Then allow them to use the block codes in ozoblockly.com to follow the directions on the task card. 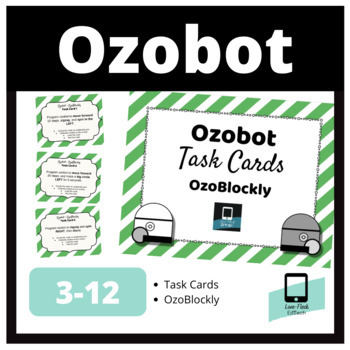 Once they have created the code on ozoblockly.com, students will need to load the code into the Ozobot, directly through the screen. Students will test their code by double pressing the power button on Ozobot. Once they have completed the task, students can move on to another card (at teacher’s discretion).